Proprietary Name: Cbdmedic Itch And Rash What is the Proprietary Name? Non-Proprietary Name: Allantoin, Lidocaine Hcl What is the Non-Proprietary Name? 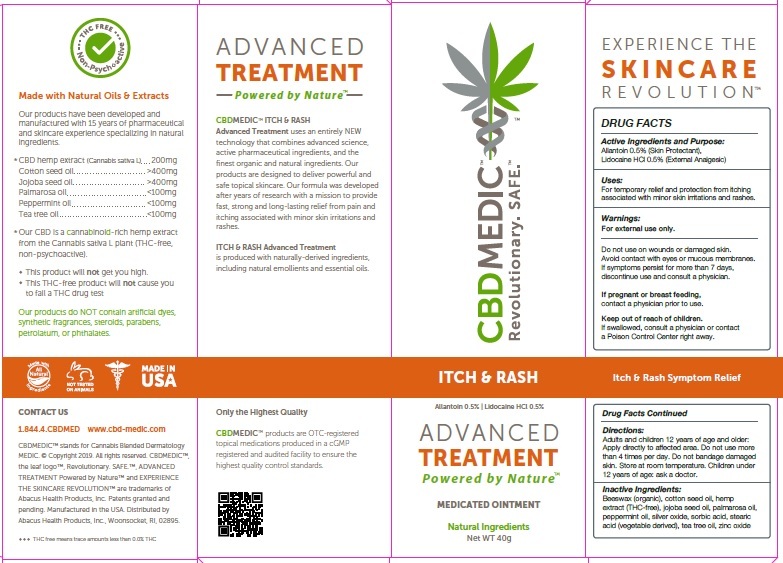 Cbdmedic Itch And Rash with NDC 24909-731 is a a human over the counter drug product labeled by Aidance Skincare & Topical Solutions, Llc. The generic name of Cbdmedic Itch And Rash is allantoin, lidocaine hcl. The product's dosage form is ointment and is administered via topical form. For temporary relief and protection from itching associated with minor skin irritations and rashes. For external use only. Do not use on wounds or damaged skin. Avoid contact with eyes or mucous membranes. If symptoms persist for more than 7 days, discontinue use and consult a physician. Adults and children 12 years of age and older: Apply directly to affected area. Do not use more than 4 times per day. Do not bandage damagedskin. Store at room temperature. Children under 12 years of age: ask a doctor.